Pizza purists can't stand the latest controversial topping. Whether debating how to properly eat a slice of pizza or the proper way to carry a pizza pie home, the beloved Italian food is an awfully touchy subject and has sparked several food fights in the past. There have been many horrendous crimes against pizza — candy corn pizza is just wrong — and the latest suspect that's making people freak out is a pizza pie that's topped with pickles. Rhino's Pizzeria and Deli in Webster, New York, has one particular pizza that's its claim to fame: The Big Dill. Recently, the Big Dill became a really big dill thanks to a viral video from Food Insider about how it's made. The process to land this tangy, cheesy concoction on customers' plates starts off with a homemade garlic sauce, which is spread on the dough instead of marinara. Then come handfuls of shredded mozzarella. The finishing touches are a heaping layer of thin-sliced pickles and a sprinkle of dill weed. Naturally, the Big Dill ignited a series of reactions across social media. It even got the attention of celebrity chefs like Gordon Ramsay, who replied with a steadfast, "No." "I'm a purist, pizza has red sauce, mozzarella cheese and meat. (and NOT chicken) Additional vegi's are permissible as long as they are from the onion, mushroom or pepper category. If you want to bake flattened dough with other stuff on it, fine, just DON'T CALL IT PIZZA! Pickle flat bread? Sure thing. Crust with chicken and white sauce? You betcha. Vegetarian Cracker Bake? Live long and prosper. Just don't EVER call it pizza. (in my humble opinion)." More people on Twitter gave the pickle topping a negative review. One person even quoted "Batman" to express the gravity of introducing a pizza pickle to the world. But others said the nay-sayers need to, ahem, "Dill with it." 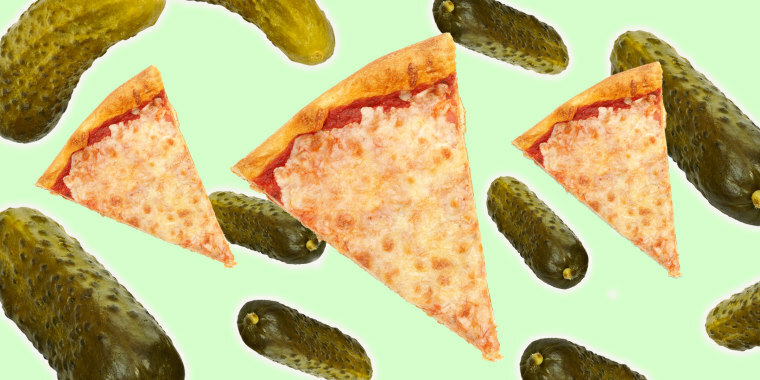 Many of the pickle pizza enthusiasts were dying to try it. Perhaps it is the solution to pregnancy cravings that's been needed all along. One person said the Big Dill just needs some sweet pineapple. But let's not even go down that rabbit hole of a food debate.